CNBC’s Sara Eisen asked me last Tuesday if I was still bearish on one of Wall Street’s favorite stocks, even after it had already fallen more than 45% since I warned you last May that it was a bad investment. All excellent points, I replied… but not one of them changes the fact that a tiny company taking market share from huge competitors in a non-growth market does not make it a growth stock. …if this company traded in line with its biggest competitor, the company’s stock price would be only $0.66 a share, or 98.22% less than Goldman Sachs suggests. Here’s why this stock’s bulls are still in for plenty of heartburn. When I first pointed to Shake Shack Inc. (NYSE:SHAK) as an investment to avoid last May, the company was trading at roughly 1,200x earnings – in an industry that had an average price-to-earnings (PE ratio) of 40. That’s come down to a Forward PE of “only” 376, according to Yahoo!Finance, now that the stock has fallen by 35%. The bulls take this as a sign of encouragement, noting that the company’s stock is somehow more reasonable at $60 a share than it was at $90. There’s still plenty of potential heartburn on the menu. Shake Shack recently filed for a secondary offering of up to four million shares on the eve of the expiration of the company’s IPO lockup period. According to SEC documents, sellers include Chairman Danny Meyer, Green Equity Investors VI, and LP SEG Partners LP, and the chain will not receive a dime. If they believed the stock was cheap and that the company had better days ahead, they’d be holding on or even buying more. As I noted in this article, individual investors are the last in line when it comes to making money from Initial Public Offerings. SHAK still trades an unwarranted premium compared to the competition. 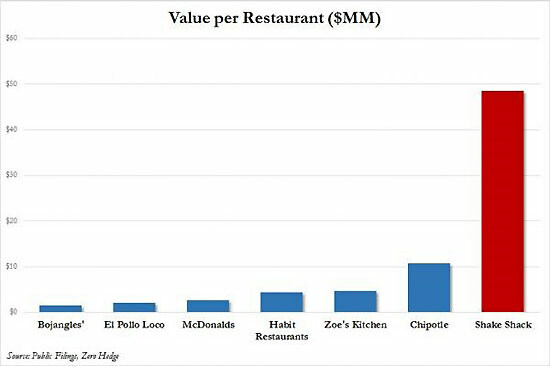 I realize this is hard to internalize, so let me break this down another way by using the value per restaurant as of last May. Do you really believe that Shake Shack is worth $50 million per location? The markets didn’t, and I still don’t. In fact, if the Shack is going to achieve a McDonald’s-like valuation per location, the company would have to open approximately 864 restaurants representing a 1,170% expansion from the 68 locations they operate today. If it traded at a PE ratio comparable to McDonald’s, (16.5 until weak earnings pushed the PE up recently) – the company that recorded earnings of just $0.04 per share last quarter would be priced at $0.66/share. That’s 98.22% less than Goldman Sachs’ target price of $37.00/share. Labor costs are going up. According to Anton, 36% of typical Seattle restaurant funds go to labor, 30% to food and 30% to all other operational costs, with only 4% remaining as profit. That means there’s only $28,000 in profit for a restaurant producing $700,000 a year. Just meeting the new $15 an hour legally mandated minimum wage will push labor expenses from 42 to 47%. It doesn’t take a rocket scientist to figure out that prices will go up, fewer people will dine out and there will be less money to go around. Adding insult to injury, revenue declines, margins rise, and profits fall. Earnings will naturally follow over time. Shake Shack’s menu is complicated and the service sequence is slow. These two things are critical to any restaurant chain that wants to scale up. You’ve got to get the food out quickly and at a fair price that justifies the wait once the fad fades and reality catches up. Shake Shack reminds me of Krispy Kreme… right before customers realized that it’s very difficult to differentiate a donut, let alone make it “worth” the premium menu price. This is a fine line fraught with danger, though. If you don’t harness the innovation that built your business, your customers will lose interest and find alternatives. This is especially true for restaurants. The metrics don’t justify the valuation. Growth advocates often like to say that a company will grow into the price the market has assigned to it, so they’re willing to “pay up.” That’s fine if you’re talking about an especially promising tech company like Apple or even Tesla, but completely delusional for a hamburger chain. Even if the company’s westward expansion is a “runway for Shake Shack” as Jim Cramer rhapsodized, the burger chain’s empire will only consist of a few hundred stores within the next couple of years. Assign it a 50% profit margin (to be generous) for the $9 Shack Stack cheese and ‘shroom burger, and the company needs to sell 480 million burgers in a year to justify the current $2.16 billion market capitalization. McDonald’s margins are 16% and they sell 75 burgers a second, while feeding close to 1% of the world’s population each day, according to Yahoo!Finance, Business Insider, and the company itself. Can you really look at yourself in the mirror and make the argument that’s going to happen with only 68 locations and less than 2,000 employees? And finally, what’s happening with Shake Shack is a very serious warning that the markets have become frothy and that investors are chasing hot ideas rather than results. …then find a greater fool who’ll buy it. Hmmm. Kinda looks like that other ‘sweet’ stock: Krispy Kreme. digitize the whole business and use robots in stead of people to do the work. I think the wall street types know all of this and more. But tapping into a fad is what they are after. They know that when the music stops, they will have already sat down. Remember the Boston Market IPO ? The small investors won’t have anywhere to sit. So Wall street is monetizing hype-no kidding. I think $9 is too much for a burger. If SHAK is going for a dining experience they failed by offering burgers. I’d rather go to subway. It’s fast and the food is good. Keith – great call, and great logic, nice work as always. Mr. Fitzgerald writes well and tell the truth. The “froth” in the market should only be found on Shake Shack’s beverage menus! LOOKS LIKE A PERFECT SHORT!!! The problem with minimum wage in the US is that there’s no strong national policy. If there was, the playing field would be levelled. Other means like tax incentives can be used to help small businesses. GREAT THOUGTHS….MAKES SENSE. yOU HAVE A VERY GOOD IMAGE AND I THINK YOU HAVE MADE GOOD PICKS. Great logical analysis! What about applying the same logic to Face Book. Please send me the symbol for the short on the Shake Shak short. What’s the deal with Prudential and Aviva? Is this company another Zurich or AIG of 2008, bailed out by US Gov?